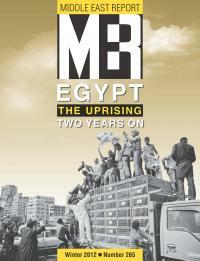 Egypt’s Music of Protest: From Sayyid Darwish to DJ Haha by Ted Swedenburg. “Reconstituting the Coptic Community amidst revolution” by Paul Sedra. Bou Nassif, Hicham 2012. “Why the Egyptian Army didn’t shoot.” Middle East Report 42(625). Hall, Matthew. 2012. “Police impunity in Imbaba.” Middle East Report 42(625). Sedra, Paul. 2012. “Reconstituting the Coptic Community amidst revolution.” Middle East Report 42(625). Stacher, Joshua. 2012. “Establisment Mursi.” Middle East Report 42(625).